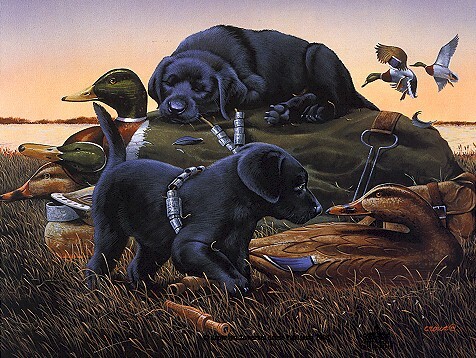 Phillip Crowe 's Limited Edition Print " Dog Days "
Phillip Crowe's new painting, " Dog Days " is a captivating portrait of two pups exhausted by a long summer day of fun with their duck decoy friends. Any dog owner knows that puppies are a lot of fun and also a lot of work. " Dog Days " is the closest thing to having your own puppy without the trouble of house training !